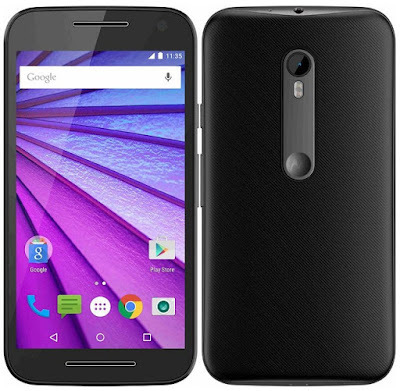 Motorolo launched the third generation Moto G smartphone in India. In the year 2013 Moto G first generation released and got huge success in India and the Moto G second generation was released in 2014. Now Motorolo comes with 3rd Generation smartphone with upgraded specifications. Moto G comes with a 5 inch HD display 1280x720 pixels resolution with Corning Gorilla Glass 3 protection. The phone is powered by Snapdragon 410 processor and runs on Android 5.1.1 Lollipop OS. It comes with two variants 1 GB RAM with 8 GB internal storage and 2 GB RAM with 16 GB internal storage. Moto G improved its camera that features a 13 MP rear camera with dual-tone LED flash, 1080p video recording and 5 MP front facing camera. It supports Dual SIM feature with 4G LTE and it has upgraded the battery to 2470 mAh. The phone also comes with IPx7 Rating for water resistance that can be used in water for 3 feet and up to 30 minutes. Also there are some added features like Moto Display shows the notifications, Quick Capture and Chop twice options. Moto G 3rd Gen comes in Black and White colors and it priced at Rs.11,999 for the 1 GB variant and Rs.12,999 for 2 GB RAM variant. It will be available exclusively from Flipkart today. Also the phone comes with a bundle of offers for buyers including Flipkart Vouchers and Airtel data offers till August 2.